Research indicates that 94% of customers would be put off returning to an outlet again if presented with dirty glassware. Ecomax glasswashers make it quick, simple and cost effective to deliver a high quality finish, every time. Double skinned door design gives a quieter bar area. Compact wash tank, quick to fill and low water consumption makes for the most economical operati..
Glasswasher with one 4 division rack. The GC glasswasher is a compact and efficient 400 x 400mm based machine capable of delivering up to 760 sparkli..
Glasswasher with inbuilt softener & one 4 division rack. The GC glasswasher is a compact and efficient 400 x 400mm based machine capable of delivering.. 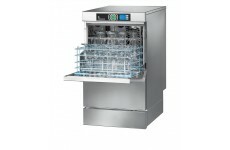 Compact glasswasher with one 5 division rack. Featuring the revolutionary INTENSIV wash system. The unique pre-wash,wash and rinse is standard on all.. 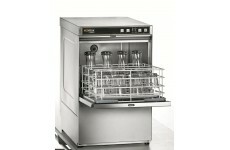 Compact glasswasher with inbuilt softener & one 5 division rack. Featuring the revolutionary INTENSIV wash system. 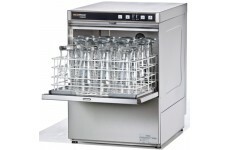 The unique pre-wash,wash and rinse..
Glasswasher with inbuilt softener & one 4 division rack. The unique pre-wash,wash and rinse is standard on all models. ..
Glasswasher with integral reverse osmosis system & 4 division rack. The GC glasswasher is a compact and efficient 400 x 400mm based machine capable of.. 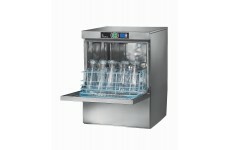 Compact glasswasher with integral reverse osmosis system & 5 division rack. Featuring the revolutionary INTENSIV wash system. The unique pre-wash,was..